The Dead Gentleman by Matthew Cody. 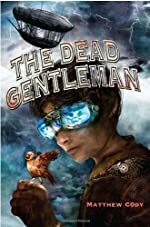 Review: Matthew Cody has written a fantastic book that might be right for you titled The Dead Gentleman. This book was written in three different parts. The two main characters of the story are Tommy Learner and Jezebel Lemon. Matthew Cody wrote the book from the main character's point of view. Tommy Learner is a part of the Explorers' Society which is a Society that tries to explore new planets and places where people can live but just haven't known about. They try to keep the Society a secret though. Jezebel is a girl that lives in an apartment with her father in New York City. She is about to see a lot more than New York City though. Part 1: When Jezebel finds the basement door of the hotel she lives in, she wants to immediately go see what she can find. When she goes down she finds a little boy about her age behind the staircase. The boy tells her that he is looking for a little brass bird that he has lost. He also tells her to stay away from dark closets, shadows, and under the bed. He warns her that if she goes in any of those places that she might never see the light of day again. Out of curiosity she goes in her closet around midnight and hears three different voices coming from the closet. How did Tommy know there was something in her closet? Part 2: When Tommy finds the little brass bird he calls Merlin, he is overjoyed. He finally has the key to bring down the Dead Gentleman's army. The Dead Gentleman has put together his army to conquer Earth. He has awakened some dead, and is using them to awaken more of the dead. The Dead Gentleman's plan is to make Earth a planet of the walking dead. The only problem for him is that if he goes out into Earth's sunlight he will be disintegrated along with his army. If he can get possession of Merlin, then he will have a chance at conquering Earth. If Tommy keeps possession of Merlin, then the Dead Gentleman can never take over the world. Part 3: Jezebel and Tommy find a way to travel to New York City in Jezebel's time frame. But when they get there, there is something big and black in the sky. It looks like a huge funnel cloud. By Tommy's reaction, you can tell he knows what it is. According to him, the Dead Gentleman is coming to take over Manhattan. Tommy grabs his boot and takes out the compass that is hidden in the sole of the boot. He keeps saying something about his is ship was coming. The next thing Jezebel knows, Tommy is in a ship in the Hudson River fighting the Dead Gentleman and she is trying to keep Merlin safe. Tommy starts his ship into a dive and then directs it straight at the Gentleman's ship. Jezebel finds the remains after the crash. She also finds Tommy's body lying on one of the platforms of a ship with a metal spike protruding from his chest. Is Tommy dead or alive? What happens to the Dead Gentleman? Matthew Cody has made yet another outstanding book. The Dead Gentleman is one of the best books I have read. Tommy and Jezebel team up to try and stop the Dead Gentleman from taking over earth. Can they stop him in time and survive the battle? This book has a lot of detail and the characters are highly developed. The mix between science fiction and fantasy is also perfect. I definitely hope that Matthew Cody writes another book to make it a series. I highly recommend this book for you. We would like to thank Random House for providing a copy of The Dead Gentleman for this review. Have you read The Dead Gentleman? How would you rate it? The Nightmare Garden by Caitlin Kittredge. The Iron Codex Book Two. Review: Many books seem very realistic, but not if they involve magic; unless, the story is in the future and written by Kaitlin Kittredge. She somehow twists and manipulates the idea of magic until it seems like reality. 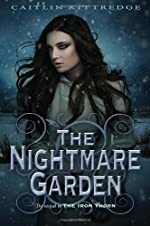 In The Nightmare Garden, Kittredge developed the characters so well that if they are in danger or they get hurt, the reader becomes afraid for them or cries. This is the second book in a trilogy; but, it is very easy to see where the story left off. The reader can pick up the second book and completely understand it without reading the first. "… I am the last person that should be writing this account, but I know that I am the only one left that can… I am the Gateminder by default, due, I believe, to chaos and chance." Aoife is allergic to iron and eventually she will contract Iron Madness. Iron Maddness occurs when the Fae are around iron for ten to sixteen years, it changes and contorts the brain until the person goes crazy; in The Iron Thorn Iron Maddness is known as a necrovirus. Her mother has already gone crazy, and Aoife doesn't have much time before she loses her mind too. Of course, Aoife runs away from the city she has destroyed and the iron that will lead to her illness, she starts to have dreams of a mysterious figure telling her to find the Brotherhood of Iron and the Nightmare Clock. The Nightmare Clock can turn back time and undo all of the destruction that she has caused. There's only one problem, everyone wants to manipulate her and she has to protect her friends Bethina, Cal, and Dean. 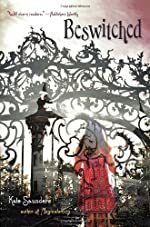 Will she find a way to keep her friends safe, not be manipulated again, find her family, and mend the gates before complete destruction? "The spires of a ruined city reach for gunmetal clouds, the horizon a wound in the belly of the sky. Acrid chemical smoke burns the insides of my nostrils, all around, sirens wail, banshees made of iron, steel and steam. Something breaks under my boot, and I know before I look down what I'll see. Bones. Human skulls, femurs, ribs. The bones of other things as well, things that starved once the humans rotted away. Twisted spines, elongated claws. Teeth. I am alone. Alone except for the sirens, alone except for the burning, empty city on the edge of a rotting, polluted river green with algae, host to rubber-skinned, gibbous-eyed things with mouths large enough to swallow me whole and protruding stomachs ready to digest me." "As the filtered glass came away from my eyes, a thin finger of violet light unfurled in the sky above me, like pale blood in dark water. It was joined by greens, blues, yellows, dancing in concert… The violet streak moved with a pattern, a purpose, with none of the randomness that indicated the true northern lights. It flowed toward a point directly east of me, where the moon should have been. The purple light gathered into a starburst, and it touched the very top of something growing out of the ice, the same color as the glacier and nearly invisible in the low light. Something so large that, from my vantage on the tower… it was blotting out the moon. Something that was reflecting starlight, like the ice and the sky, invisible until the aurora touched its spire." As the reader can tell from the very first page and well into the story the setting is always in mind. Since Kittredge is so descriptive and developed the characters so well I rate The Nightmare Garden five out of five stars. I highly recommend this book to anyone who enjoys suspense, thriller, action, and a drop of romance. I will definitely read The Nightmare Garden again! We would like to thank Random House for providing a copy of The Nightmare Garden for this review. Have you read The Nightmare Garden? How would you rate it? Review: The Nail is a 90 foot high cliff, hanging above the deep dark water below. In the California town of La Paloma, people have been jumping off of it all the time. But, when one thing goes wrong, it can result in serious injury, or even death. Previous tragedies still remind everyone of the risks. There is even a story of a girl who became paralyzed, and won't ever be able to walk again. In this thrilling, enjoyable, and fast reading novel, Jumping the Nail written by Eve Bunting, can anyone be stopped from jumping? Once Dru finds out that a boy named Scooter is going to jump, can her boyfriend, Mike, and her stop him? He's a daredevil and loves to get his adrenaline going. Dru's friend Elisa might jump too, but will she breakdown and give in? After nearly forcing her to jump with him, Scooter now has bragging rights. However, Elisa seems to be haunted by the soul of a girl from the depths of the waters below the Nail. Claiming that the ghost wants her to stay, she tries to avoid going near the Nail. There are supposed to be other jumps, but will they end like Scooter's and Elisa's did? Or will the jumper die a painful death? The only way to find out is to read Jumping the Nail. Jumping the Nail deserves a five out of five stars rating. It was an enjoyable and stunning fast read that kept me glued to it. The intensity of the book is very high at some points, and the reality of it is scary. 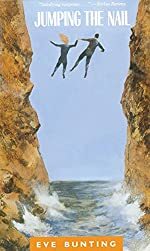 I think the author didn't just write this book for a good read, but to teach a lesson that jumping off cliffs, or more importantly blindly following others, can be foolish and dangerous. Many people die from jumping into the waters below. With these two points together, it makes a fantastic book. I think everyone should read it, and I hope they learn a valuable, life-saving lesson from it. We would like to thank Houghton Mifflin Harcourt for providing a copy of Jumping the Nail for this review. Have you read Jumping the Nail? How would you rate it? Facts of Life: Stories by Gary Soto. Review: Have you ever tried to get away from what you were like when you were a little kid? Well in this fantastic book titled Facts of Life by Gary Soto, that is exactly what all the kids are trying to do. They aren't just trying to escape their childhood but, they are also trying to have a part in the everyday world. As you go through this book you will be able to see what I mean by having a part in the everyday world. The kids in the book think that taking these two steps will get them completely away from their childhood. In Facts of Life it is hard to describe one of the stories to bring the whole picture together so I while describe all stories. The whole concept of the book is put together, and forms what Gary Soto calls the Facts of Life. To begin the title of the book is most important when it comes to choosing the book. The title Facts of Life is catching because it encapsulates the whole point of the book which is filled with tips on how to be successful in life which would help a lot. Finally the book itself is also basically a handbook for people on how to be successful, and trust me this book could change your life if you read the book the whole way through. Gary Soto's Fact of Life is a fabulous book, and I give this book an easy five out of five stars. The reason it deserves five stars is because this book is appropriate for anybody who can read the type of material in the book. Also I think the book deserves five stars because the book is very helpful to younger kids. The reason is because it will not just be a fun book to read, but also a fun book to experience. What that means is that some younger kids might actually experience what happens in this book. So in all with these 3 factors put together they can make an amazing book. So maybe next time you go to the library maybe instead of getting your favorite action hero book, think about getting a realistic book like Facts of Life. We would like to thank Houghton Mifflin Harcourt for providing a copy of Facts of Life: Stories for this review. 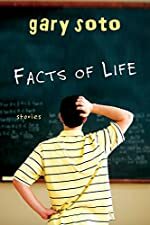 Have you read Facts of Life: Stories? How would you rate it? Review: Spoiled. Selfish. That's how a lot of people are these days, that is until everything is taken away from them and the life they had once known is now gone, leaving them in a completely different life. You might even say that they were transported back to the past, as is the case of Beswitched by Kate Sanders. Flora Fox is a spoiled, young girl who thinks everything is about her. So when her parents send her away to a boarding school, she is furious. She is sure they are just trying to ruin her life. Even though Penrice Hall is any child's dream school with swimming pools and no homework, Flora's set on not going. She eventually finds that this is a battle she can't win. She reluctantly goes to Penrice, packing all the necessities of a girl from the 21st century. But on the train, she is suddenly tired. She closes her eyes and is unexpectedly approached by three ghostly figures. When she awakens she finds herself in ridiculous clothes and sees that all her technology is gone. As it turns out, Flora has traded places with a 1935 girl who is now living the life of glamour back where Flora should be. As Flora tries to fit in at her new school, St. Winifred's, she meets new friends, Pete, Dulcie, and Pogo, and finds out that they are the ones who brought her here. Together, they must find a way to get Flora back home, before she forgets everything about the future. Beswitched was an amazing book! I couldn't put it down. It took me a while to read, but that was because I kept rereading all the chapters over and over again. I'm so glad I get to keep it. I'll most likely read it again. Beswitched was really interesting and made me think about what life would be like without the things we take for granted now like iPods and computers, and even showers and tooth paste! No one that I know could survive without all of the things Flora did not have. She was a very unpredictable character. I could never tell exactly what she was going to do next, which made the story brilliant and adventurous. Beswitched is a very creative book and I'm going to try to get everyone I know to read it. It's different from most books because it pulls you into the story and it doesn't let you go. We would like to thank Random House for providing a copy of Beswitched for this review. Have you read Beswitched? How would you rate it? Lives of the Musicians: Good Times, Bad Times (and What the Neighbors Thought) by Kathleen Krull & Kathryn Hewitt. Review: Lives of the Musicians, written by Kathleen Krull, and illustrated by Kathryn Hewitt, is all about musicians. As it says in the subtitle, this book is about "the good times, bad times, and what the neighbors thought." This book does not have a series, or is part of a series, and it has very many main characters. This book doesn't only tell you about the lives of Clara Schumann, Scott Joplin, Woody Guthrie, Ludwig van Beethoven, and Wolfgang Amadeus Mozart, the musicians pictured on the cover. This book tells about the lives of twenty musicians. From Antonio Vivaldi, Johann Sebastian Bach, Frederic Chopin, to Nadia Boulanger, Sergei Prokofiev, and George Gershwin. Lives of the Musicians describes the lives of these twenty or so musicians, in a humorous, yet informative way. It tells where and when each musician was born, and where and when each musician died. What they wore, where they lived and how they spent their money were described, the book described the messiness of their houses and what specific things they liked to buy just for the fun of it, which was very amusing, because a lot of the time they were crazy. So were so many more very informative and interesting facts about musicians. Each musician was alive in a different time period, like the 1800s, during the Industrial Revolution, or during the Dust Bowl, like Woodie Guthrie. Each had a different style of music, like ragtime, or classical. This book teaches that all of them aroused emotion in their audiences, no matter what time it was or what music style it was. I liked Lives of the Musicians a lot. Each musician's chapter included a very well-drawn picture, so that I knew kind of how they looked like. The end of each musician's chapter had a paragraph called "musical notes." This paragraph told facts about select musical numbers that the musician preformed or composed. This book kept me engaged, and very interested, because sad things, and usually boring things, would be written in a humorous tone, and I was very entertained. Every boring thing that could have been written in this book was written in such a way that it was funny, because of the authors' word choice. I did not like the random pictures between paragraphs, some were unrelated and they broke the flow of the story to me, because they were so distracting. Another thing I did not like about this book is how dramatic it was, because the dramatic parts of each story didn't fit with the other parts, which were funny and made me laugh. But, in my opinion, this book was an enjoyable book overall, and very factual. I hope that the author and the illustrator team up again to write more informative books. Review written by Gwen (7th grade student). 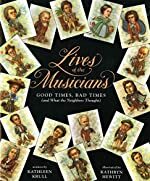 We would like to thank Houghton Mifflin Harcourt for providing a copy of Lives of the Musicians: Good Times, Bad Times (and What the Neighbors Thought) for this review. Have you read Lives of the Musicians: Good Times, Bad Times (and What the Neighbors Thought)? How would you rate it? Saving the Ghost of the Mountain: An Expedition Among Snow Leopards in Mongolia by Sy Montgomery. A Scientists in the Field Book. Review: Saving the Ghost of the Mountain is written by Sy Montgomery and the photographer is Nic Bishop. The book is a non-fiction that takes you on a journey with Sy Montgomery, Nic Bishop and scientist, Tom McCarthy. It tells you what they felt and gives you some personal insight. The setting of this book is in Mongolia. The scientist Tom McCarthy had dedicated his life and career to Blue, a snow leopard. The scientist Sy Montgomery and the others went on a trip to Mongolia. The Saving the Ghost of the Mountain takes you on an adventure to different states/regions in Mongolia. The scientist explores small valleys, and tall mountains. Also, the reader can see how to build a Ger (tent). The scientist finds scats and footprints of the leopards. In fact, the reader can read all about snow leopard. They can learn about the habitat, food and even appearance. They live in the mountains of Mongolia, and eat small game. Did you know that snow leopards can cover 25 miles in one night? Also, the Altai Mountains in Mongolia stretch for 1000 miles. I enjoyed Saving the Ghost of the Mountain. It taught me a little Mongolian. For example, "Tim-ay" means Camel. Any reader can enjoy this book and can be expert on the snow leopards. I learned many facts and also, I learned that snow leopards travel alone expect a mother with her cubs. I also learned that snow leopards are most active from dawn to dusk. The reader can really enjoy the book and can be a great research tool. I really enjoyed Saving the Ghost of the Mountain. We would like to thank Houghton Mifflin Harcourt for providing a copy of Saving the Ghost of the Mountain: An Expedition Among Snow Leopards in Mongolia for this review. Have you read Saving the Ghost of the Mountain: An Expedition Among Snow Leopards in Mongolia? How would you rate it? Black Gold: The Story of Oil in Our Lives by Albert Marrin. Review: The author of Black Gold: The Story of Oil in Our Lives, Albert Marrin, is the author of many non-fiction books for young readers. His books include Years of Dust, His World, and Flesh and Blood so Cheap: The Fire and its Legacy. Albert Marrin has a scientific interest in how various, often overlooked, natural phenomena impacts human life. His main goal is to give children a better understanding of what is happening in the world. You have probably heard about the high demand for oil and rising prices, but why is this happening? Black Gold: The Story of Oil in Our Lives, takes readers to the origin of oil. It gives the reader the reason why oil is in such demand. Oil is sometimes called Black Gold because it is one of the most important things in this modern day world, but how did people feel about it fifty years or one hundred years ago? Black Gold: The Story of Oil in Our Lives will take readers on a ride through the ups and downs of drilling and the uses of oil. The book tells how wars have been won due to oil. It explains how the Allies beat the Axis because they had more fuel, which allowed them to deploy troops faster than their opponent. Albert Marrin has been awarded multiple times for his non-fiction writings. His many honors include the Washington Children's Book Guild and The Washington Post Non-Fiction Award. He also received the Humanities Medal, awarded to him by President George W. Bush. I enjoyed this book because of how Albert Marrin was able to explain to me the importance of oil. It took me step by step of how oil developed over time and how oil evolved. I also enjoyed how Albert Marrin explained how World War II, as well as other wars, depended on oil. I now understand why gas prices go up and down. The illustrations that were included in this book helped me visualize what I was learning. 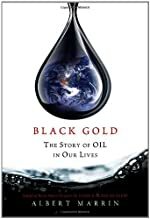 Out of 5 stars, I give Black Gold: The Story of Oil in Our Lives a 5. I was enlightened by all the information included in this book. We would like to thank Random House for providing a copy of Black Gold: The Story of Oil in Our Lives for this review. Have you read Black Gold: The Story of Oil in Our Lives? How would you rate it? Abe Lincoln At Last! by Mary Pope Osborne. A Magic Tree House Book. Review: Time travel, Abraham Lincoln, a magic tree house and more! Abe Lincoln At Last! by Marry Pope Osborn is a good book. It will make you want to read to the whole Magic Tree House series. This is book 41 in the Magic Tree House series. 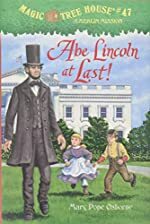 In the start of the book, Jack and Annie wake up and go directly to the magic tree house from where they are whisked away to the White House where they meet brothers Willie and Tad. Willie and Tad take Jack and Annie to see Abraham Lincoln, but Jack and Annie are suddenly teleported away to the woods where they meet an orphan named Sam. Sam is tragically hit by a horse and gets a concussion. Will Jack and Annie help Sam or will they go try to meet Abraham Lincoln? Find out by reading Abe Lincoln At Last!. Abe Lincoln At Last! deserves 3.5 out of 5 top hats. Kids 2nd through 3rd grade would love this book. The words are easy to read, so younger kids will have an easy time reading the book. There are no swearing words so that is a plus for parents who are looking for an age appropriate book. The book is quick read for anyone 9 and older. There is a lot of action in the book so look forward to that. On the downside though, there is very little humor. To somewhat understand the beginning, you need to read books 40 and 39. Overall, Abe Lincoln At Last! is a good book. It deserves 3.5 out of 5 top hats and is great for long car trips, to read if you have nothing else to read and is great for book reviews. We would like to thank Random House for providing a copy of Abe Lincoln At Last! for this review. Have you read Abe Lincoln At Last!? How would you rate it? The Gathering Storm by Robin Bridges. Book One of the Katerina Trilogy. Review: The book I am reviewing is called The Gathering Storm by Robin Bridges. This 387 page book is a fictional story based on Russian culture and history with a magical twist! 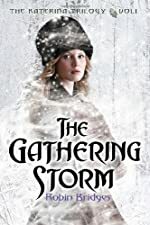 The Gathering Storm is a very intriguing story and I would like to give you a little insight on it. The story takes place in Russia in the early 1800's. The main character, Katerina Alexandrovna, Duchess of Oldenburg, has a deep dark secret that she has kept for many years. She can raise the dead. Katerina considers herself cursed and tells no one, but pretty soon her secret starts to leak out. In the kingdom, evil forces are rising and threatening the tsar. Katerina's power draws to her side George Alexandrovich, the tsar's son, who repelled by her gruesome powers, feels she could play an important part in saving Russia. Prince Danilo, heir to the Montenegrin throne, takes a sudden interest in Katerina and tries to win her over with his dashing looks and persuading words. Katerina knows she cannot hide from her fate any longer and must choose a side, either light or darkness, and to whom she will give her heart. The fate of Russia lies in her hands. This haunting yet romantic book was very well written and thought out. Each character was very detailed and had an interesting background. Each scene left you wanting more. The writing is very powerful. You will find yourself cheering on Katerina as she struggles to distinguish what and who is good or evil, and where her heart lies. This book is so well written that as I read it I forgot it was fictional and didn't question characters coming back to life. It draws you in and you find yourself becoming Katerina. I enjoyed reading this fascinating book! I would definitely recommend this book to anyone looking for a classy intriguing dark romance story. When I finished this book I found myself checking to see if there was a second book that went along with it, it was that good! This was a wonderfully chilling book, which is indeed the first book in the Katerina Trilogy, is now officially one of my personal favorites! If you're looking for a haunting yet beautiful story then this is the book for you! We would like to thank Random House for providing a copy of The Gathering Storm for this review. Have you read The Gathering Storm? How would you rate it? Echo's Revenge: The Ultimate Game by Sean Austin. An Echo Hunt Novel. 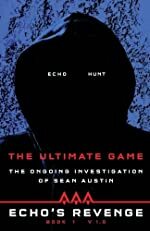 Review: Dangerous, thrilling, and suspenseful, are just a few words that I would use to describe, Echo's Revenge, the first installment of the Ultimate Game series written by Sean Austin. This action packed thriller is jam-packed with adventure and will keep you at the edge of your seat. I was able to finish this book fairly quickly, since I couldn't put it down. One of the reasons is because it is about one of my favorite things, gaming. The main character in this story is Reggie; he is part of a group of gamers that is being hunted by Echo-7 (a robot that escaped the virtual world.) Imagine this, the nation's best gamers all joining forces to defeat the 4th dimension……….fear. They all come to a focus group because the AAA Company wants to make their gaming experience more realistic. For once, besides beating each other online with virtual characters in a make believe realm, these gamers actually interacted with each other. Little do they know how much they will really have to work together in the near future. Meet Reggie King aka "Waiting for you" (Online ID/gamer tag), the Nation's best gamer. Reggie and his brother Jeremy have a stepfather-Asa that physically and emotionally abuses them. They have adapted to Asa's nonsense and turn to gaming as a way to escape it. However, it isn't just running away from home Jeremy and Reggie have to worry about. Now, in addition to escaping their abusive step-father they are running from an evil robot who is trying to capture and enslave them. Shortly after attending the focus group, Reggie realizes that he is being hunted down; the predator is echo-7, a robot from the game has gone berserk, the prey are the gamers. His hunting pattern has started in the Northeast of the U.S.A. and will end up all the way in California, near Sacramento. What this means is that Reggie and his brother Jeremy will be the last victims since they are currently traveling to Pasadena, California; which happens to be relatively close to Sacramento. Therefore, Reggie and Jeremy have to make haste and get to somewhere safe, to Aaron King, Reggie's real father. On this runaway plan or as Reggie and Jeremy called it, "Operation Thunderbolt", they encountered many helping hands, such as drivers that would bring them closer and closer to Aaron King's house. Fortunately, they narrowly avoid echo many times, just by the "skin of their teeth." Despite the constant setbacks and hindrances they face, they beat the odds add are one house away from their destination when both Reggie and Jeremy suddenly lose consciousness and wake up in a dark and unfamiliar place. Where are they? Who has captured them? And, are they enslaved forever? Often times I've wondered what it would be like if the video game that I was playing, was reality. Well, after reading this book I'm glad that video games are purely fantastical, or are they? You'll just have to read Echo's Revenge, by Sean Austin, and find out for yourself. We would like to thank AAA Reality Games for providing a copy of Echo's Revenge: The Ultimate Game for this review. Have you read Echo's Revenge: The Ultimate Game? How would you rate it? 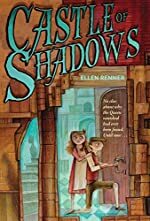 Castle of Shadows by Ellen Renner. Review: Imagine that a young princess is being caught and yelled at for stealing a servant's lunch. Yes, you read that right, a princess who is stealing her own servant's lunch. However, she only does this out of a terrible hunger, not cruelty. This may seem very odd, but for Princess Charlotte Augusta Joanna Hortense of Quale, this is part of survival. This is the beginning of the book Castle of Shadows written by Ellen Renner. The genre of this book is the web of lies and secrets of mystery. This book is set in the castle and streets of the city of Quale, most likely in late 1700's to mid 1800's England. The main character of this book is Princess Charlotte Augusta Joanna Hortense of Quale, or as most of the few people who ever mention her name call her, Charlie. For eleven-year-old princess Charlie, life is terrible. Five years ago, her mother, the queen, mysteriously went missing. Due to severe depression from this, her father the king went mad, and now spends his days swinging from the scaffolding in his chambers building fifty-foot card castles. Charlie's housekeeper the dreadful Mrs. O'Dair gives her scarcely enough food to survive, and treats her like a disobedient peasant. Charlie's life mainly consists of wandering about the castle in the tattered old clothes that Mrs. O'Dair supplies her. Charlie has no hope that she will ever find her mother again, and restore the kingdom and the king to their former greatness. Then one day, she finds an unfinished letter written by her mother those five years before in a book she must bring to the gardener's boy. The letter gives her the only clue to the whereabouts of her mother that had ever been found. Charlie begins a search to find her mother with very little knowledge of the first thing to do. In her search, she must face her horrible housekeeper, the usually drunken night watch, who has recently received a gun from none other than O'Dair, and someone who seems to be a friend but is the greatest enemy of all. Her unlikely ally is the gardener's boy who is usually the one against her, but has a motive of his own to help her. She learns very quickly, and can put on quite an act. The story was written with beautifully used figurative language; Renner put it in the perfect places and used exactly the right words. The plot flowed exceptionally well, and varied in speed and intensity so well that I am just blown away. Ellen Renner filled the genre of mystery very well, she included all of the main aspects of a great mystery, including suspense, intrigue and excitement. The hook of this story is very effective, because it pulls you right into the action. However, before this, the prologue might capture your interest even more. The author was very descriptive, she used the words so well that you could see in your mind what was happening, she was able to make it so clear how desolate and lifeless the castle was. The end of the book wrapped up the story very well, explained all of the loose ends. It did not leave you with any questions, just as a singular novel should end. Overall, the book was exceptional to say the least. I give this book four stars out of five. I recommend Castle of Shadows to 12-13 year olds, or 10-11 year olds who can handle a bit of intense language. We would like to thank Houghton Mifflin Harcourt for providing a copy of Castle of Shadows for this review. Have you read Castle of Shadows? How would you rate it? Lawn Mower Magic by Lynne Jonell. Book Two in the New Magical Mix-Up Series. 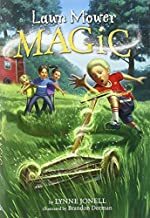 Review: This book is called Lawn Mower Magic and is the second book in its series. Its author is Lynne Jonell. The main character is Derek, a kid that is the second youngest of four kids, two boys and two girls. It is in the modern age on a hillside. Derek and some other kids have found magic, but is it on their side or not? In Lawn Mower Magic, Derek and his family have just moved away from all of his friends into the countryside. Derek wants to get a train ticket to go back to his old neighborhood to play with his friends, but his parents can't afford it. They need to buy a new lawn mower to mow their huge yard. Derek offers to try with an old push mower and asks for help from his siblings. It turns out that the lawn mower has some magic in it, and it starts mowing away! Derek now needs to stop it from mowing. Can he and his siblings catch the magic lawn mower? Will Derek get the train ticket? Some elements of the book that I liked were that it was a fast, fun read. It was pretty short but was fairly exciting. I would recommend reading the first book before this because it might be confusing. I also recommend this book to kids in third or fourth grade, or just older kids who want a fast read. Overall, it is a great book but I do see some flaws. I think this book should have more encounters with magic in the hills, not just with a lawn mower. There should definitely be a sequel that should be a collection of these encounters. I do like how the characters are divided and very thorough. The book explains in detail what the characters want. I really feel what the characters want. I give this book a four out of five; you should definitely consider reading it! Review written by Sean (7th grade student). We would like to thank Random House for providing a copy of Lawn Mower Magic for this review. Have you read Lawn Mower Magic? How would you rate it?